OTTAWA - China's defence minister made an unheralded stop in Canada last week, meeting with two Harper government ministers amid rising tensions over the use of chemical weapons in Syria. Gen. Chang Wanquan had face-to-face discussions with Defence Minister Rob Nicholson and Foreign Affairs John Baird last Thursday, says Western defence sources and Chinese media reports. There was even a side trip to Kingston, Ont., where Chang visited the Royal Military College and the Canadian Army staff college before returning to Beijing. Chang's visit, unlike those of ministers of other high-profile nations, was kept off-the-radar by the Harper government, which neither issued a statement nor revealed that the two nations have apparently agreed to enhance military ties. Publications in China say a deal was signed to promote high-level military exchanges and to establish a mechanism whereby the two countries can talk defence matters directly with one another. A spokeswoman for Nicholson, Genevieve Breton, confirmed the meeting took place and described the agreement as a "non-binding" co-operation plan that formalizes a process already in place. Although not raised with Nicholson, the question of whether Syria came up in Chang's other discussions remains a mystery. Defence expert Rob Huebert said the government's silence is puzzling and troubling. Earlier in its tenure, the Harper government took a hard line on China's human-rights record, Huebert said, and the Conservatives may be reluctant to be seen "cozying up" to Beijing for domestic political reasons, and at a time of heightened international tension. As a permanent member of the UN Security Council, China, along with Russia, has often frustrated Western attempts to organize an international response to the bloody civil war, which tore apart Syria and left tens of thousands dead. Beijing has strong trade ties with the regime of Bashar al Assad. Another issue of importance has been the increased use of cyberattacks on western commercial, industrial and government targets. Last winter, a U.S.-based cybersecurity firm, Mandiant, accused a secret Chinese military unit in Shanghai of mounting hundreds of online attacks against American companies. Last June, former defence minister Peter MacKay raised the issue with Chang, saying he laid down "clear markers" when the two met in Beijing. Breton confirmed the topic was discussed again, but would not provide detail. Canada's energy and mineral resources, particularly in the Arctic, have been of growing interest to the Chinese, says Huebert, of the University of Calgary. "The North is of growing strategic importance to China, both for minerals and as a possible shipment route," said Huebert, an expert on the Arctic. A polar institute was recently established at a major Chinese university, and the country, which does not border the Arctic, has announced plans to build an icebreaker. China also recently won observer status at the eight-member international Arctic Council. "They are taking this quite seriously and I can see them as among the most active observers in terms of research, especially into understanding climate change," said Huebert. Whether that translates into a military threat — or at the least a desire by China to send military ships through the Northwest Passage — remains to be seen. 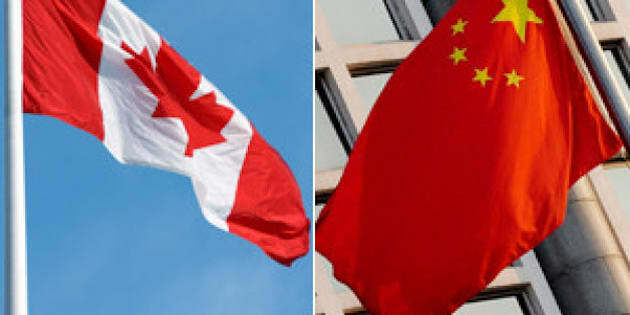 All of the activity caught the attention of Canadian military officials who have instructed defence researchers to study China's plans and ambitions in the region. A defence spokesman, Maj. Andre Salloum, said the report by Defence Research and Development Canada, completed in March 2012, concluded that "China's involvement in the Arctic was focused on scientific, environmental, climate, as well as economic interests."